Seat Exeo/Exeo ST Multitronic | What Car? A continuously variable automatic (CVT) gearbox mated to the Volkswagen group's 141bhp 2.0-litre turbodiesel engine in a compact saloon and estate (ST) that owe a great deal to the previous-generation Audi A4 and A4 Avant. Why not fit a more modern twin-clutch semi-auto gearbox? The VW group's twin-clutch systems have been designed for transverse-engined cars and the Exeo's engine runs front-to-rear. All Exeos now have a bit more rear legroom and easier rear access because the seats and the base of the central roof pillars have been reshaped. The gearbox and engine complement each other nicely if you're looking for a smooth, refined drive, and the 'box gives you the option of overriding the shifts manually, although it's not the snappy, sporty affair Seat would have you believe. The reshaped seats result in a substantial 44mm more legroom for people in the back, and it's a bit easier to get into and out of there, too. The shifts aren't particularly quick, even when you do them manually, so all Seat's bold words about the Exeo Multitronic living up to the sporty brand ethos don't quite ring true. The CVT gearbox makes the Exeo's CO2 emissions around 10g/km worse than they are with the six-speed manual and will add an estimated 1500 to the car's price, so your company car tax will take a bit of a hit. 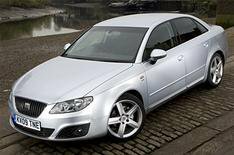 A very pleasant choice if you want a relaxing, refined diesel auto saloon, but it could be a bit costly to run.